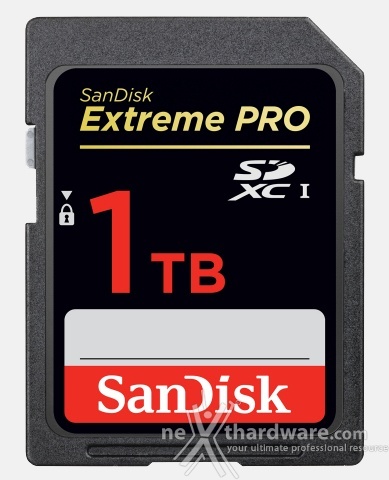 SanDisk Extreme Pro SDXC da 1TB, ovverosia 1.000 gigabyte. E' della controllata Western Digital la prima SD card a raggiungere la ragguardevole capacità di 1TB ed é anche normale visto che un file RAW non compresso di una mirrorless come la SONY A7R MarkII può arrivare ad occupare oltre 80MB senza colpo ferire. E dal momento che le fotocamere multi-megapixel ormai abbondano e sono in grado di registrare video 4K, spesso con Mbps elevati, beh, il mercato dei supporti di registrazione cerca di adeguarsi, almeno sotto il profilo delle capacità. COLOGNE, Germany-(BUSINESS WIRE)-PHOTOKINA - Western Digital Corporation (NASDAQ: WDC), a global storage technology and solutions leader, today unveiled its SanDisk® 1TB terabyte (TB) SDXCTM card prototype at the world's leading trade fair for photo and video professionals. With increasing demand for high resolution content, such as 4K and 8K, the company continues to push the boundaries of technology with solutions that support the exponential growth of data-intensive production demands. "Showcasing the most advanced imaging technologies is truly exciting for us," said Dinesh Bahal, vice president, product management, Content Solutions Business Unit, Western Digital. "Sixteen years ago we introduced the first SanDisk 64MB SDTM card and today we are enabling capacities of 1TB. Over the years our goal has remained the same; continue to innovate and set the pace for the imaging industry. The SanDisk 1TB SD card prototype represents another significant achievement as growth of high-resolution content and capacity-intensive applications such as virtual reality, video surveillance and 360 video, are progressing at astounding rates." "Just a few short years ago the idea of a 1TB capacity point in an SD card seemed so futuristic - it's amazing that we're now at the point where it's becoming a reality. With the growing demand for applications like VR, we can certainly use 1TB when we're out shooting continuous high-quality video. High-capacity cards allow us to capture more without interruption, streamlining our workflow, and eliminating the worry that we may miss a moment because we have to stop to swap out cards," said Sam Nicholson, CEO of Stargate Studios and member of the American Society of Cinematographers.